I’m so happy to be here to share this delicious recipe with you. 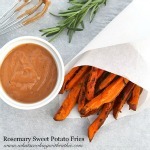 I just love Sweet Potato Fries! Hmmm, mmm. AND coupled with Rosemary and Olive Oil this side dish just can’t be passed up! Oh my… we can’t forget the Secret Sauce either! I love being a Contributor here every month! I love having Ruthie as part of The 36th Avenue team! or connect with her at on Facebook, Twitter, Pinterest, or google+. Thank you all for visiting with us. I can not wait to try out these sweet potatoes and sauce. I am originally from Africa, Zambia and my mom always had these potatoes in her garden. This brought back great memories. Thanx for sharing..